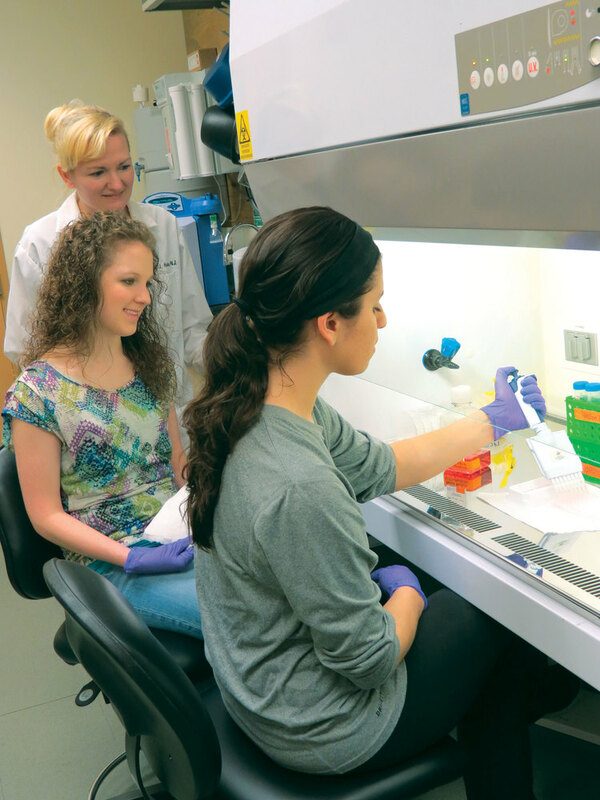 Walsh student Lucy Zappitelli was attracted to Dr. Amy Heston’s cancer cell research not through a love of chemistry, but through a goal to become an oncology nurse. Under the direction of Dr. Amy Heston, Associate Professor of Chemistry, Walsh undergraduates are researching the devastating effects of heavy metal poisoning with the hope of creating something good out of something bad. It was Dr. Heston’s background in chemistry and love of forensic science that led to her current research project involving heavy metal ions and their effects on cancer cell lines such as brain, skin and breast cancer. Dr. Heston’s team, including Dr. Joe Lupica and students Christine Stenger, David Liu and Lucy Zappitelli, presented its research at the National American Chemical Society Meeting in Philadelphia last August. The team, including Michelle Colopy, presented its results at the National American Chemical Society Meeting in Indianapolis in September 2013. Michelle’s contribution was the focus of her senior Honors thesis as well. "As a professor and research advisor, I feel very blessed to have such a wonderful and productive research group,” said Dr. Heston. “My students not only have shown dedication to their academics at Walsh, but also have excelled in acquiring advanced laboratory techniques through this research experience." Dr. Heston was awarded sabbatical for fall 2013 to continue her research projects at Walsh while collaborating with one of the top ranked forensic science institutions in the country, Marshall University, in forensic toxicology. During her leave, she also dedicated time to the development of Walsh’s first forensic science laboratory course and continue service projects to inspire young students in chemistry and forensics. A. J. Heston, D. Banerjee, P. L. Rinaldi, C. A. Tessier "NMR characterization of the higher molecular weight byproducts formed during the synthesis of [PCl2N]3", J. Inorg. & Organomet. Poylm. & Mat., 2007, 17, 477-481. A. J. Heston, M. J. Panzner, W. J. Youngs, C. A. Tessier "Lewis acid adducts of [PCl2N]3", Inorg. Chem., 2005, 44, 6518-6520. A. J. Heston, M. J. Panzner, W. J. Youngs, C. A. Tessier "Acid-base chemistry of [PCl2N]3" Phosphorus, Sulfur Silicon Rel. Elem. 2004, 179, 831-837.